Who needs a fancy resort when you can create a fantastic vacation with nothing more than a tent, a few sleeping bags and some firewood? Family camping trips are inexpensive, easy to plan and a wonderful way to get some much-needed rest and relaxation together (away from work and school and email inboxes). 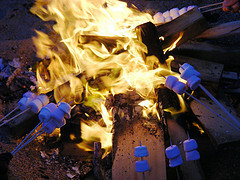 Gather around the fire, toast up some deliciously gooey marshmallows and play some good old-fashioned campfire games. If you can’t get away for a full weekend, go camping in your backyard for a night! Set up a tent, and use a fire pit or lanterns instead of a campfire. You’ll still have a blast, and it will feel miles away from home. Create your own karaoke party in the great outdoors. Sing songs you know well a cappella (“Puff the Magic Dragon,” “On Top of Old Smokey,” “Yellow Submarine” and “She’ll Be Comin’ ‘Round the Mountain” are good starters) or use a campfire songbook to help you remember lyrics. Bring a guitar, a tambourine or a battery-operated CD player for back-up music. Tell an epic fairy tale, uproarious comedy or nail-biting adventure… or all of the above! Start a story with half of an enticing sentence (for example, “Jessie woke up this morning with an astonishing super power…” or “Kevin thought his day couldn’t possibly get worse when all of a sudden…”), then pass it along to the next person to finish. Keep going and watch as the story becomes more and more outrageous. Get in touch with your dramatic side and play charades, the game where you have to act out a word or phrase without speaking. Split into two teams and have each group write down titles for the other team to pantomime (try to keep the ideas simple or silly if you’re playing with younger children). When you draw a slip of paper, indicate to your team whether you’re acting out a movie, a book or a TV show. Then, indicate how many words are in the phrase, and get going! See more charades rules and tips on charades. Older children will love hearing (and telling) traditional spooky stories around the campfire… Just don’t be too surprised if everyone wants to sleep close to you in the tent! Check out a copy of the compilation, Scary Stories to Tell in the Dark, for classic tales including “High Beams” and “The Viper.” Right before bedtime, lighten the mood by telling a few funny or silly stories. What are your favorite activities to do around the campfire? Share your suggestions, and happy trails!